Public input has played an essential role in shaping the Valley Line Southeast LRT and how it will fit into the neighbourhoods it serves. Since 2008, thousands of Edmontonians have been engaged through workshops, stakeholder interviews and meetings, questionnaires, online consultations and open houses. Construction activities on the southeast part of the Valley Line started in spring of 2016 and will open to the public at the end of 2020. The Edmonton Arts Council and City of Edmonton announced the 14 public artworks for the Valley Line Southeast LRT at City Hall. The artworks are commissioned through Edmonton’s Percent for Art policy. Four Edmonton artists, three additional Alberta artists, two Indigenous artists teams and one international artist were selected. The artworks range from intimate, community-focused glass art and sculpture at neighbourhood stops to large-scale sculpture, paintings, mosaic, and glass, at the Churchill Connector, Tawatinâ Bridge, Davies Ramp, and Davies Station. Artworks were chosen from a total of 260 proposals by a series of selection committees comprising community members, local artist representatives, City of Edmonton and project personnel. On Friday September 15, 2017, the Government of Alberta announced that it is providing an additional $176-million grant to the City of Edmonton for construction of the southeast leg of the Valley Line LRT. The funding was originally provided to Edmonton in 2014 as an interest-free loan. The province is now converting this loan into a grant, with funds coming from Climate Leadership Plan revenues. The Edmonton Arts Council commissioned Canadian Métis artist David Garneau to create artwork for the pedestrian walkway on the Tawatinâ Bridge. The artwork will have more than 400 panels, each shaped and painted to refer to Indigenous aspects of the region. TransEd Partners issued a 2016 / 2017 construction schedule, as well as a lookbook of Valley Line concept renderings. 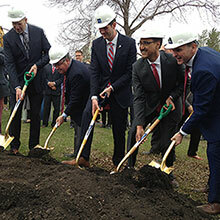 Valley Line LRT construction officially launched on April 22 with a groundbreaking ceremony at the future Muttart Stop. Mayor Don Iveson was joined by federal Minister of Infrastructure and Communities Amarjeet Sohi, Alberta Minister of Transportation and Minister of Infrastructure Brian Mason, and representatives from Edmonton’s Indigenous communities, the Valley Line Citizen Working Groups and TransEd Partners to celebrate this exciting milestone. Preliminary design was in place. Focus was on securing funds to start the Southeast to Downtown portion of the project. The City established a 102 Avenue Streetscape Design Guide to be applied when the Valley Line LRT is built. The Streetscape Concept recognized 102 Avenue’s status as a significant, multi-use corridor and is intended to create a more welcoming environment for all users, including cyclists and pedestrians. The design guide is part of the City’s Project Agreement with the public-private partnership (P3) contractor. The construction of the Valley Line LRT resulted in permanent changes to the roadways that will be used for the LRT alignment. In some cases, service roads were absorbed into main arterial roads to allow for widening. Elsewhere, two lanes of traffic in a particular direction were reduced to one. To address concerns about the safety of some private accesses that would back out onto the LRT tracks, bylaws were prepared for public hearing and consideration by Transportation Committee to close a number of such accesses. All affected property owners were notified, and in all cases, alternative access will be available. The access closures took effect over the year. The City worked with affected property owners to address any issues they might have. Five Citizen Working Groups were established as part of the City’s commitment to ongoing citizen engagement during the procurement, detailed design and construction phases of the Valley Line LRT project between downtown and Mill Woods. Each group includes members assigned by community leagues, business, recreational and cultural organizations and by community members themselves in a series of public meetings held in the spring. City Council accepted Transportation Committee's recommendation and approved updates to the Environmental Impact Screening Assessment (EISA) and Site Location Study (SLS). These updates included minor adjustments to the Project Area in the North Saskatchewan River Valley made in response to stakeholder concerns identified during the preliminary design process. The Transportation Committee made its recommendation following a non-statutory public hearing which featured presentations from LRT Design and Construction, citizens and community groups. The City posted responses to questions about the Valley Line LRT - Stage 1 Request for Proposals (RFP) online. The City received 98 public inquiries and questions about the Valley Line RFP from 14 different individuals and groups during the question period. A Request for Proposals (RFP) was released to private sector teams so they could bid to design, build, operate, maintain and partially finance the Valley Line. Teams prepared designs for the Valley Line that met criteria established by the City. Submissions for final bid happened in fall 2015. A project agreement was finalized. Construction of the new line between downtown and Mill Woods is scheduled for completion in 2020. Parts of the RFP were posted online to ensure openness and transparency during the P3 procurement process. Federal MP Rona Ambrose, Provincial MLA Wayne Drysdale and Mayor Don Iveson jointly announced that all funding for the Valley Line was in place and the $1.8 billion project was ready to proceed to procurement. With these motions, the Valley Line LRT project officially began the procurement phase of the project. The provincial government announced its funding commitment to the Valley Line LRT project. With the final funding piece in place, pending Council's approval of the overall funding strategy, the Valley Line was able to proceed. Thanks to our provincial and federal partners, the Valley Line remains on schedule for construction to start in 2016 and opening to the public by the end of 2020. The province agreed to contribute $250 million in GreenTRIP funding, $150 million in additional funding, and $200 million in a 10-year interest free loan. This joins the City's own contribution of $800 million, along with the federal government's contribution of $250 million from P3 Canada and an expected $150 million through the Building Canada Fund. Council voted in favour of a motion that established LRT as Council’s number one priority for new infrastructure spending. Council’s discussion and vote emphasized the need for long-term funding commitments from the provincial and federal governments in order to achieve Edmonton’s goals for LRT and public transit. Councillors noted that all necessary commitments from the City, including funding, design and planning, were in place for the Valley Line LRT project to proceed. The preliminary design phase involved stakeholders and interested members of the public to define the look, feel and integration of the line in their communities. With the progression of the project, an effort was made to officially name all of the City’s future LRT lines. The combined Southeast, Downtown and West sections were officially named the Valley Line. For the Preliminary Engineering project, six key areas were identified as the basis for public consultation. 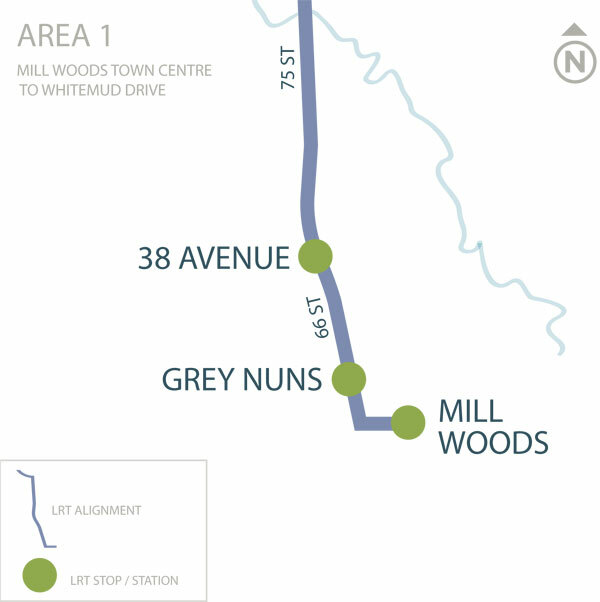 Following two years of design and consultation, the preliminary design of the 27-kilometre urban style LRT from Mill Woods to Lewis Farms was completed. In stage 5 the public was invited to view the final recommended preliminary design of the Valley Line LRT. This round of engagement included information-sharing on the environmental impact assessment process, findings, and recommendations. The City had a two year plan to develop and finalize the Preliminary Design for 27 km urban style low-floor rail system from Mill Woods to Lewis Farms. Following extensive public input, the names of the current and future LRT lines were decided. The LRT stop and station, bridge and facility names for the southeast portion of the Valley Line LRT was also determined. However, the stops, stations, bridges and facilities on the west portion of the Valley Line would have to wait until funding and a construction timeline were determined. Government of Canada announced a $250 million investment from the P3 Canada Fund to support construction of the Southeast to West LRT Line. Additionally, Council approved $60 million in funding for P3 advisory services and the owner’s engineer for the P3 procurement phase, and for advancing utility relocations and building demolitions. City Council approved the concept for a new bridge that will take the Southeast to West LRT across the North Saskatchewan River into the downtown. Public input, technical feasibility, and cost were factors in the selection of this bridge concept. Stage 4 collected final input on the proposed designs and other key elements discussed in Stages 2 and 3, and presented updates on the ongoing technical developments. The focus of the area meetings in stage 3 was to present preliminary designs of stop and station elements for each area, proposed changes to roadways and related concepts for connectivity and pedestrian/cyclist access. Participants had opportunities to be involved by attending the meeting in their area or by participating online. Stage 1 ran from November 2011 to February 2012. The project team focused on developing the public involvement plan to guide all public involvement activities throughout the project. The plan was based on input and information from June 2010 to June 2012, as well as new information gathered through interviews and online surveys with stakeholders. Stage 2 ran from March to April 2012. The project team consulted the public for the Southeast to West LRT through community conversations in six consultation areas along all 27 kilometers of the line. Each meeting included a presentation and small group discussion of how the LRT could integrate with communities. While gathering public feedback the project team defined the route selection - which determines how the line will fit within the corridor. The project team worked with the communities to create a concept plan to present to Council. A report on how the public was consulted about the Southeast to West LRT concept plan amendment was available in March 2012. When approving the route Council considered the impact on property owners and ultimately selected an alignment that minimized the need for private property acquisition. However, in some cases, privately-held property will need to be acquired in order for the project to proceed. City Council approved the proposed amendments to the concept plan, making the entire line ready to move forward with preliminary design. The project team presented two options for the downtown route - 102 Avenue and 102A/103 Avenue - and supporting reports from the public consultation. 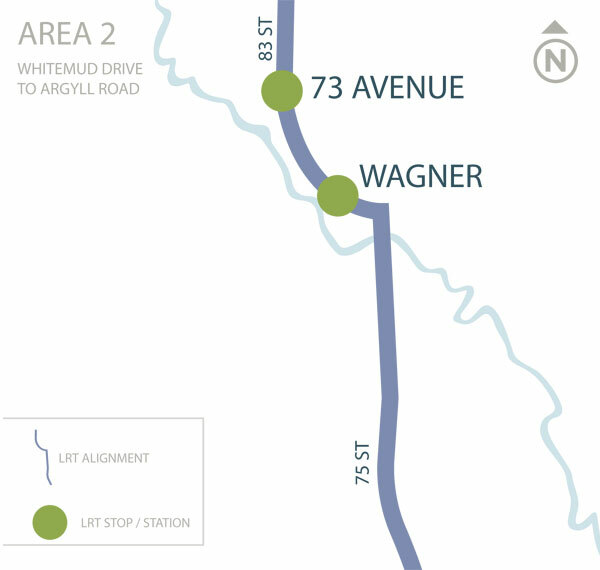 Council approved the 102 Avenue route options for the downtown portion of the Southeast to West LRT Project. Council was presented with a report that recommended the concept plan for the Downtown LRT Connector between the West and Southeast lines. The project team was asked to return to Council on January 18, 2012 and provide details on an underground option for 102 Avenue and 102A Avenue, a LRT Stop on 95 Street and 102A Avenue and alternate options for 102A Avenue/103 Avenue, including details regarding why 102A Avenue was not used. A revised recommendation was completed and shared with the stakeholders. The project team worked with the community in the vicinity of 102 Avenue and 102A Avenue between 95 Street and 97 Street to discuss local concerns and opportunities, and collectively developed four LRT options. City Council approved $39 million to proceed to preliminary engineering for the Southeast and West portions of the LRT line. Following the approval of a study on the downtown LRT connector corridor study on June 21, 2010, a concept planning study was initiated to define where the LRT would fit within the approved corridor, where LRT stops would be located, and what type of access changes would be required for vehicles, pedestrians, and cyclists. A public involvement process was initiated to support the planning study and to identify local issues and impacts that needed to be addressed through the planning process. The project team followed up with a concept on November 15, 2011. 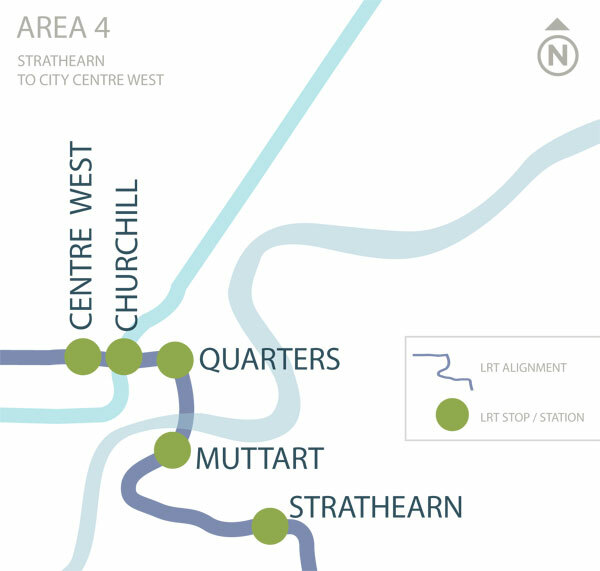 At the June 21, 2010 City Council meeting, Council determined that a downtown LRT connector would be defined. Council approved the downtown LRT connector corridor in June and asked the project team to provide more details on the refinement of the downtown alignment. 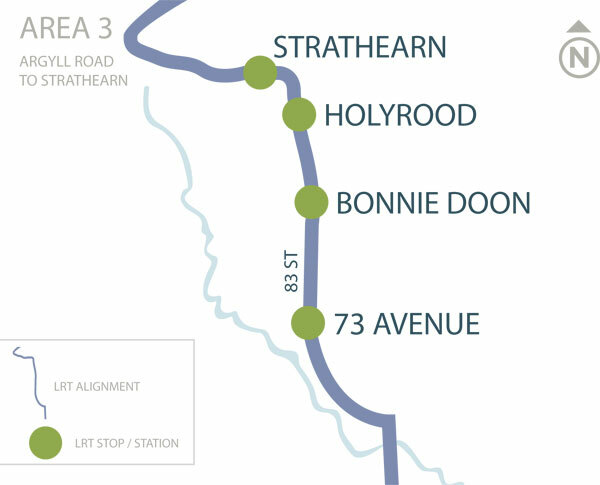 The development of the recommended concept plan involved additional engineering and public consultation to evaluate various options of the alignment. The Downtown LRT Connector information session provided stakeholders with information about the LRT planning process, the recommended Concept Plan for presentation to City Council and to receive and summarize feedback to inform City Council. Council approved $102 million for land acquisition along the Valley Line corridor. Clarification was presented to Council on how the project team would assess and mitigate vibration and intersection impacts, ridership forecast, Park & Ride options and neighbourhood accesses. Council approved the amended Southeast and West LRT Concept Plans that were presented. The Transportation and Public Works Committee reviewed the Southeast, West and Downtown concept plans. Reports for Council were requested for March 22, 2011 to get more clarity on some costs, assessment and impacts. Information sessions were held to share the final proposal to Council and get feedback on design options and concept plans in preparation for the non-statutory public hearing at the Transportation and Public Works Committee scheduled for December 8, 2010. City Council approved the surface downtown section of LRT. The work to determine the downtown LRT route was developed in conjunction with the Capital City Downtown Plan. The project team was now focused on how the LRT route would “fit” into the corridors. Using public feedback the project team defined corridor selection and high level concept of where the line will run. At this stage the line was divided into two sections. Southeast from Mill Woods to downtown and West from downtown to Lewis Estates. City Council passed a motion to make the combined West and Southeast LRT lines the next priority after, or concurrent with, the NAIT line (now known as the Metro Line). City Council approved the proposed Southeast and West LRT corridors for the LRT expansion. The approval followed extensive public involvement, recognizing that new LRT development will play an important role in shaping the future of our City and result in significant benefit and impact to businesses, communities and institutions. The corridor selection reports explain the project structure, alternatives identification, screening process, evaluation criteria and a summary of the technical analysis key points. These points were completed and presented to Council, along with a public involvement report that summarized how the public was consulted on the corridor selection and the outcomes of those meetings. Prior to these reports, the Southeast to West LRT (now known as the Valley Line) corridor had not been defined. 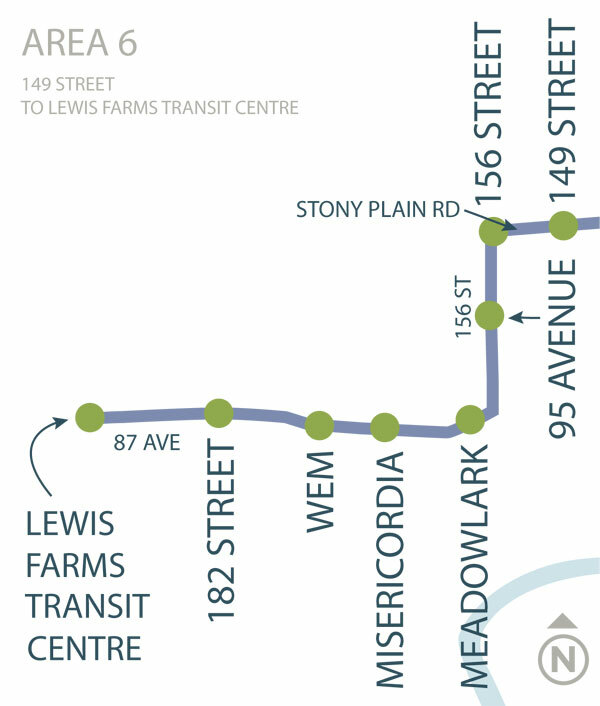 After consulting with the public, it was recommended that the West LRT would run from Lewis Estates (now known as Lewis Farms) to 109 Street at MacEwan University, and the Southeast LRT would run from Mill Woods (28 Avenue and 66 Street) to 109 Street at MacEwan University. These reports detail the decision-making process conducted by the City to determine the recommended corridor for the Southeast to West LRT. Online consultation and two public workshops were held to solicit input on the LRT route options. As the technical analysis was completed, information from this phase of consultation was used to ensure local issues were considered within the technical evaluation and to identify consultation points for further study. Interviews gathered feedback on the five possible routes identified by the project team and received input on a proposed public involvement plan for the project. In March and April 2009, a Questionnaire and a series of face-to-face interviews were conducted with key stakeholders. This information was used to help refine the discussion points for further public involvement. A summary of public feedback was completed in the Public Involvement Themes Report. City Council approved a new criteria for LRT Route Planning and Evaluation. This criteria reflected a shift in the City’s strategic planning direction, as reflected in The Way We Move and The Way We Grow. For LRT and Transit investments, the original goal was to minimize travel times and increase ridership, but the new focus was finding a balance of travel time and shaping land use. At this time, planning studies were underway for a West LRT line. However, the change in policy direction led to a decision to re-evaluate potential west routes. In 2009, the City also completed a long-term study to define the future size, scale and operation of Edmonton’s LRT system. 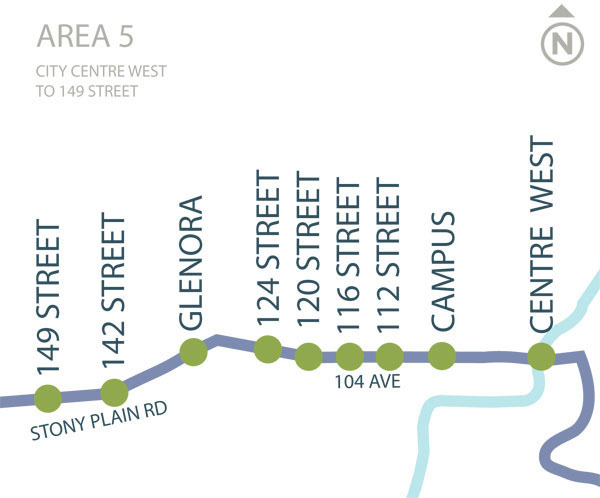 The Network Plan calls for the potential development of five LRT lines across the City. For lines that don’t physically connect into the existing system, such as the Valley Line, the Network Plan called for the development of Urban LRT. This means the system should have smaller, more frequent stops that are better connected to the surrounding community.